FuzziBunz perfect size and one size pocket nappies. FuzziBunz® are a unique (patented in USA) design made from a single layer of a high quality, lightweight 100% breathable polyester fleece, and a breathable waterproof fabric to prevent leakage. These two layers of the FuzziBunz® form a pocket with an opening at the back, forming a pocket. 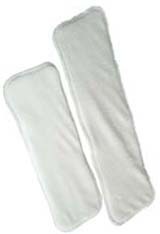 With the One Size, two microfibre insert are included in the price. a smaller one and a larger one. You can add one or both inserts to the pocket as required. The One Size FuzziBunz® adjusts to fit from approximately 7 to 35lb by its unique adjustable elastic rather than the more usual poppers down the front. Similar to adjustable waistbands for children and maternity wear, the waist and legs can be customised through a button / elastic adjustment system. So instead of the 3 length settings of a standard popper adjusting, you can set to 8 or more different sizes. Instead of no waist settings which lead to poor containment and bulk at the waist, you have up to 4 or more adjustments. This gives you a VERY adjustable nappy without an excess of snaps. It may take a bit of "adjusting" to get to the right size, but when you find the right fit, you set it and forget it. For those wondering about whether the button would dig in - the elastic is nicely wide and encased in so that only fleece is next to your baby, and the button will neatly tuck in under the fleece. In a One Size nappy 'durability' is especially important, as you will want the nappy to fit for the 2.5-3 years your baby is in nappies, and possibly for other babies. Therefore the FuzziBunz® is designed to last. The snap closures are designed to last for at least 3 years and are durable way beyond the hook and loop fastenings of other nappies, and the unique adjustable elastic can easily be replaced without unpicking or re-sewing. Please note that New 'Perfect Size' FuzziBunz® are now supplied inclusive of one FuzziBunz® microfibre insert, One Size FuzziBunz® are supplied inclusive of two sized FuzziBunz® inserts.